Fructa Partner is a European specialist in the manufacture and marketing of fruit juices and soft drinks. The group called upon Wink Stratégies to improve its visibility and boost its brand image, in order to make it more accessible and attractive. – Creation of a new colourful and energetic logo, where the term “Fructa” was put in the foreground, to the detriment of the “Partner,” more institutional. These different elements made it possible to create the graphic universe of the future website. The new e-commerce website was intended to highlight the proximity and accessibility of the brand to Internet users, while improving the overall visibility of the company. 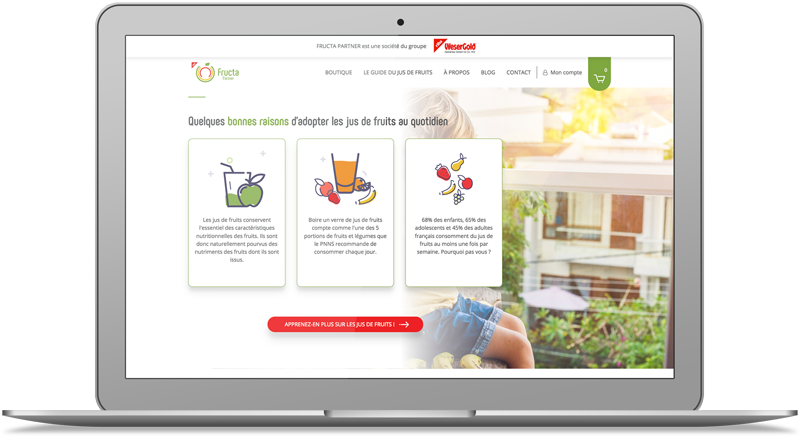 From content creation to online publishing, via web design and complete development, the agency has developed an ergonomic and dynamic website, in harmony with the new image of Fructa Partner.